Hello this is Apex Awesome and today I am going to o a post on Call Of Duty Modern Warfare 2 or MW2 for short. 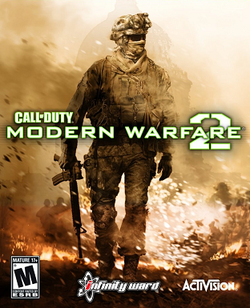 MW2 is a 18+ first person shooter game and contains bloody violence and strong language. MW2 is good in the main campaign you are play as private first class Joseph Allen, Sargent Gary “roach” Sanderson and Captain “soap” Mac Tavish. In the campaign it is about a terrorist called Vladimir Makarov, he committed brutal acts of terrorism and you are trying to kill him. There is three game mode campaign or story mode, Multiplayer and Spec Ops. Spec Ops or Special Operation where you do various mission as you progress you will unlock other missions. Also there is a multiplayer mode where you can play with two controllers. As well a online mode where you are playing with other people or your friend if they have the game in order to rank up and get promoted such as (private first class, specialist and captain) as well as being promoted you will unlock some thing such as guns, kill streaks, death streaks and create a class. Now most of the games multiplayer has been hacked which makes it a crazy shooter mania. Kill streaks are vehicles that help you out when you kill a certain amount of times and death streaks are when you die a certain amount of times. I would rate this game a must buy 8/10.please subscribe:)!! !